If you do metalworking, then you know having a welder makes your job ten times easier. It’s not only useful but also versatile and great to use with a multitude of tasks. There are various welders on the market, so it’s important to know what you’re looking for before making a purchase. The best MIG welder is an option that many beginners use because of the ease and many advanced metalworkers enjoy for the versatility. 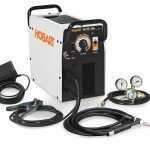 In our best MIG welder reviews, we highlight the machines you want to consider. It doesn’t matter if you are a professional or just a hobbyist, having the best MIG welder opens up a new world of experience to you. They don’t require a lot of knowledge to operate and many of them are budget-friendly. In this article, we’ll take an in-depth look at what a MIG welder is, why you need one and offer some of the best MIG welders on the market right now. Some of these are geared more toward professionals, but we also have plenty that will work for the beginner. Regardless of what level you find yourself at, you’ll surely find the best MIG welder in our list. Let’s dive right in. If money isn’t an issue and you want the best MIG welder, we’ve got quite the selection for you to choose from. Most of these machines are geared mainly to the professional user, but that won’t stop a home user from having a top of the line rig as well. Dual-voltage (115V/230V) with MVP plug makes the unit easy to find a place to plug it in. With this high-end MIG welder, you can expect a dual-voltage system that works seamlessly no matter what you have to accomplish. Transfer back and forth as your needs change; just switch your plug. If that’s not enough versatility for you, this welder features 11 various voltage settings. With 115 volts, you have access to seven options. At 230 volts, there are four. This allows you to finish many jobs without switching to another machine. In addition, Hobart is one of the more reliable brands on the market. They are trusted by many professional welders every day. They offer a high level of attention to detail and their products are always reliable. You can’t use flux-core wires with this machine, but it’s easy to work with a variety of steel, even stainless. There’s also a spool if you want to weld aluminum. Lower-end models won’t come with this, so you are getting a good value for your money. Whether you are a beginner or a pro, you’ll find that the Hobart Handler tackles anything you throw at it. It won’t take long before you know how to use this machine like your life depends on it. That’s why it’s the best MIG welder for anyone that desires a versatile and reliable result. If you need to find the best MIG welder that you can take anywhere, this Everlast model is a top performer. It’s a perfect choice if you desire lightweight, smaller welders. It only weighs 35 pounds and there’s still plenty of customization to get the job done right. You have access to up to 120 volts while you weld. Even though it’s designed for gas operation, it will adjust to work with flux-core, if you are experienced enough. We don’t recommend doing this unless you really know what you’re doing. Some of the best features on this machine include the thermal overload warning, voltage adjustments and variable speeds. There’s even a wire feeder included for convenient operation. The Everlast welders come complete with a built-in control cover. This ensures you don’t accidentally hit the unit’s knob and alter any settings while you weld. While this unit is priced lower than the last, it is still on the higher end of the spectrum. Unless you plan to use it often or you need portability, this might not be the best MIG welder for you. One of the best things it has going for it is the five-year warranty. That’s one of the longest in the industry and surely offers you some additional peace of mind. When you have a superior brand like Miller Electric behind the manufacturing of your machine, you know it’s one of the best MIG welder units around. The price of this machine reflects how great it operates, especially if you want a professional rig. They are known for their reliability and versatility. It’s the perfect investment when you need to do a good job. Even though this is a bigger machine, it’s easy to operate. You can easily use this as a beginner. Your confidence will be boosted when you see how simple it is to weld your metal with this machine. While it isn’t the lightest machine out there, it is portable and easy to maneuver as well. Furthermore, there’s an auto-set mode that provides quick set-up. This mode also administers a tip saver which saves you from short circuits and reduces the spatter. With this best MIG welder, you can handle material thickness up to 3/16-inch plus it features a maximum output of 140A. The angled aluminum drive system features a robust wire drive. Plus, it features a quick select drive roll to make setup even easier with three grooves. The biggest downside to this unit is that there aren’t a lot of customer reviews yet. With that said, it is from a reputable brand and the reviews it has received are all favorable at the time of this writing. If you want the best MIG welder, but don’t have an excessive amount of money to spend, there are still plenty of options available to you. We’ve got a nice selection to choose from. If you need a good mix of performance and power, this Lotus welder might be the best MIG welder for you. This machine offers the ability you need to get the job done. Thanks to its 175-amp motor, it’s simple to operate anywhere between 200 and 240 volts. That offers the versatility you need to get most any job accomplished. Work with almost any metal when you have the LOTOS. You can even complete tasks with your stainless and soft metals or aluminum. It also comes with a spool gun for your convenience. Adjust your wire speed and voltage settings with ease, which makes this a great buy for a beginner. It also offers the ability to do flux or gas welding. Because this machine comes with thermal overload protection, you remain protected while working. This is helpful considering the high voltages you’re utilizing. If your machine gets too hot, it will automatically shut down before destroying anything. At 85 pounds, this is a heavier machine and not ideal for portability. If you don’t plan to move it, you won’t have a problem. Just keep in mind that it only comes with a one-year warranty, which doesn’t seem long enough considering the price. Normally, you won’t find a portable, compact welder also designed for high-performance work. That’s not the case with this option as the best MIG welder. Hitbox provides plenty of power in this smaller container. While many other lightweight units will offer you 120 volts of power, this firecracker provides 270 volts. Its range is off the charts as well. You have access to 160 through 270 volts. That makes this machine quite versatile and ready to take on anything you throw at it. It also features a digital customization system which helps you achieve the results you need. The LED display offers the wire speed and voltage in an easy to view format so you always know what’s going on. There are even indicator lights which alert you when the machine is overheating. If you do face overheating, the welder shuts down so no damage is done. You can choose between flux-core or gas welding with this unit to add even more versatility. It even features an energy-efficient motor so you could run it off a generator if you needed to. The fact that it’s only 12 pounds also means that you can take it with you on the go. Whether you are a beginner or professional, you’ll find this machine works great. Multi Use: Welding Stainless steel, Mild Steel, Aluminum (with a spool gun, not include in the package, need to purchase separate) and Other Metal Materials. If you like the Lotus brand, we have another option available for you. There’s no question they make some of the best MIG welders around and this one comes with a nice price point. Keep in mind that this machine won’t be ideal if you need a lot of customization, but it’s great if you do the same welding tasks over and over again. At 54 pounds, it’s not extremely heavy and still light enough to move around when needed. It’s also compact and great for small job sites. Because of the smaller side, it also has a lower power range of 110 volts. This is sufficient for most regular or stainless steel, plus it works with aluminum too. While this machine does come with a one-year warranty, you will have to purchase your spool gun separately. This welder features ten different settings and you can adjust the speeds from 0 to 100%. There’s also a 2T/4T switch to further customize how quickly your welder heats up. You’ll always have access to the two displays which show you the voltage plus percentage. This allows you to complete your jobs with precision and accuracy. For the price of this welder, you just can’t beat the value. Beginners especially will find that it’s easy to use and offers professional results. Lincoln Electric is a leader in the welding industry, so you know you’re investing in a great machine. This go-to option could easily become the best MIG welder and the price isn’t too bad either. The multi-voltage functionality helps you to accomplish a variety of tasks. With this unit, it’s simple to take on heavy-duty professional welding tasks and the simple hobby jobs as well. Run it on an industrial 230-volt power supply to receive the maximum 180-volt power output. There’s almost no limit to the materials this machine handles. It is slightly heavy at 66 pounds, but that shouldn’t stop you from carrying it around to various jobs. Use it for gas-shielded MIG welding or flux core operation as well. The fully adjustable drive system reduces wire crushing and tangling. It does come with a one-year warranty, but some customers have had trouble getting coverage. This unit might be overkill for many beginners as well, but it wouldn’t take long to learn if you wanted to. If you want the best MIG welder, but have to watch what you spend, we even have a few options for you. These three welders will get the job done without breaking the bank. If you want to save yourself some money and time, you’ll be interested in this unit from Forney. It’s one of the best MIG welder units for those on a budget. It will require a little more cleanup than your typical welder, but it’s great if you aren’t as concerned with appearances. This flux-core model is compact and gets the job done. Keep in mind that this isn’t meant for professional, high-performance jobs. Of course, you couldn’t really expect that anyway in this price range. If you just want to do some spot welding and don’t want to get your normal rig out, this would make a great second machine in the shop. You can use it with a two or ten-pound spool plus it operates on 120-volts. Simply turn the switch and you have the capability for sheet metal or thin plates with ease. It also comes complete with a thermal overload alarm. This keeps you protected from damaging the welder. It only weighs 32 pounds, so you could take it on the go as well. They even included a carrying handle to make that easier for you. Beginners are fond of this setup because it comes with everything you need to get started. You won’t have to purchase any additional gear to get moving. With the lower price, we can’t expect a long warranty, so it’s not surprising that you only get six months of coverage. There are a lot of similarities between the last Forney and this one. They are both designed with the beginner user in mind and come with a low price. This machine is one of the best MIG welder units because of how simple it is to get started. Keep in mind, just like the last one; it’s only geared toward gasless/flux-core welding operation. The voltage and wire feed speeds are controllable, making this machine versatile. It’s a great welder for do-it-yourself projects, repair and maintenance projects. The biggest asset this machine has going for it is the compact design. It only weighs 19 pounds so you could take it anywhere with you. This would make a great second machine to use when you don’t want to lug your larger, more professional welder with you. What’s most surprising is that it still comes with a one-year warranty even though the price is so low. With a company like Forney backing you up, it’s likely you’ll never need to use it. This is on the higher end of our budget scale. The price does fluctuate at times which puts it in the category above, so make sure you purchase it at the best time possible to save a little extra. This Hobart works great on a standard 115V household outlet, making it a great option for the hobbyist. It comes complete with a long-lasting feed head and a quick-release drive roll level. This offers great control during all your projects. The electric arc from the feed wire slices through your material without ever creating slags. It handles a wide variety of materials as well. That’s part of the reason it’s one of the best MIG welder machines. There are five voltage control settings for more versatility. This allows you to fine-tune the operation perfectly. While all of this might seem overwhelming to a beginner, it’s not that difficult to learn. Hobart is a reliable name that many welders trust. It weighs 57 pounds, so it isn’t the lightest in the bunch, but still completely portable. In addition, it comes with a one-year warranty to offer additional peace of mind. In a MIG welder, the steel wire cylinder or electrode is fed from your machine through a liner. Then, it comes out a contact tip in the gun. The welder uses energy to heat the wire and melt it so it works as an adhesive with your metal pieces. Inert gas is added to the liquid metal in order to protect it from the atmosphere. As you utilize the melted electrode, the two pieces of metal join together while passing through your welding gun. This entire process is fast and goes quicker than with a traditional arc method. Plus, you don’t need to use welding rods. That allows the best MIG welder to be operated by users of any skill level and for most any job. Using the best MIG welder comes with many benefits. Here are the most common. Shielding gas, otherwise known as an inert gas is used during GMAW MIG welding. Using these gases ensures that vapor and oxygen don’t permeate your work area. Although these inhibit oxygen, it could also produce a weak weld if you don’t use it correctly. That’s why you want to choose the right amount and type of gas for the detailed work you perform. It’s also essential that you know shielding gas is often expensive. Before you make any purchase, you want to know exactly what you need. Do your homework and find a shielding gas that’s effective for your task but also helps you to save some money in the long run. If you prefer to weld without gas, you’ll want the best MIG welder for Flux Cored Arc Welding. This utilizes a flux cored wire instead of the traditional solid MIG wire. In a gasless MIG welder, your flux cored wire separates your weld pool from the oxygen. You can utilize a self-shielding tubular flux-cored wired to remove the oxygen. It eliminates the reliance of weld pools on the atmospheric gas. Of course, gasless welding contains several benefits. The biggest one is that the MIG welder is functional in any environment or position because it doesn’t need protection from the atmosphere. It’s also a more efficient and cost-effective way to weld. Another reason people choose this method is because beginners require even less skill to get started. Finally, flux cored arc welding creates welds that have little porosity. That leaves you with a solid mass for your joint. Before you purchase the best MIG welder, you need to look at a few aspects of the machine. Evaluating each of these contributes to you making the right choice for the best MIG welder that fits your needs. One of the main things to inspect when looking for the best MIG welder is output power. If you plan to use thin metals and work on home projects, then 100 amps should be more than enough. Rigs featuring 140 amps or more are ideal for working on thicker projects. They will cost you more, but the versatility is worth it. You’ll also want to examine the minimum power output when you plan to use a wire fed welder. 30 amps are good for 18-gauge metal. If you need to weld fragile metal around 22-gauge, then opt for a machine that has a minimum of 20 or 25 amps instead. Almost as important is the wire feed rate. This feed speed tells you how fast the MIG wire feeds from your machine into the gun. If this rate is slow, the wire disappears as soon as it comes into contact with your metal. This leaves you with an uneven, undesirable weld. If the wire fees speed is too fast, then the cord reaches out the gun and causes spatter. If you have a continuous arc, then the wire is moving fast enough. The best MIG welder comes with an automatic speed setting which adjusts your rate based on relative power. If you need to make minor adjustments, there is often a manual override option. Using thinner wire such as 0.023 or 0.030-inch prevents burning through while working with light materials. On the other hand, using thicker MIG wires, like 0.045-inch, allows for a better fusion when working with thicker metals. Most people use wire types ER70S-3 plus ER70S-6. If you need a multi-purpose welding wire, you’ll opt for ER70S-3. The ER70S-6 is primarily used for dirty surfaces or metals with rust where deoxidizers are required. Knowing your wire size in advance helps you to determine what type of MIG machine you need. They all play a part in deciding what type and size wire you can use while welding. Of course, performance needs to be the primary consideration when choosing the best MIG welder, but you also want to think about its size. If you have limited space or plan to carry it around at all, you don’t want a monster. MIG welders come in a wide range from 25 pounds up to several hundred. Your portability depends mainly on what you plan to accomplish. 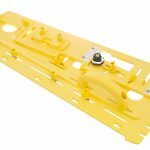 You could also consider purchasing a cart if you want to make things slightly easier. These are often used during auto body work when moving around the car is essential. The duty cycle refers to the time limit that the machine runs at a pre-set amp output and voltage without exceeding the component parts temperature. This output is proportional to your welding output. Most commonly, you’ll find the duty cycle measured in a ten-minute sequence. You might also see them in elaborate form as well. For example, 20% at 180A/240V means that the unit runs for two minutes and then needs to cool down for eight minutes before you restart. MIG welders come in two forms, either the type that needs a gas cylinder to operate or flux cored. Some offer the capability to use both. Many beginners think that the flux core sounds like the better option because you don’t need a gas cylinder. It’s important to keep in mind that the flux core creates a slag layer which must be chipped away afterward. We generally recommend purchasing the best MIG welder with multi-function capability. This offers the most functionality. If you want to weld aluminum, you’ll want the best MIG welder with a spool gun. The smaller variety usually doesn’t come with this, so be careful to look for the feature. If you prefer to purchase a spool gun, make sure you get one with the quick-release option. Make sure you only purchase your welder from a reputable brand. Many of the top names include Lincoln, Everlast, Miller and Hobart, but there are several others worth considering. You want to trust a brand that has been around and offers good customer service to users. You also want to read all the terms with your warranty. If you plan to purchase a cheap welder, it’s very likely the guarantee won’t be sufficient. Both Longevity and Hobart offer customers five-year warranties. Considering the machines themselves are already high-quality, it’s unlikely you’ll need to use it anyway. We wish the price wasn’t a factor when purchasing the best MIG welder, but it is. Everyone has to think about their budgets in relation to their needs. Determine how much you’re willing to spend up front and then attempt to find the best in that category. We broke down our top ten best MIG welders into price ranges to make the selection easier for you. Don’t let others tell you what you need when looking for the best MIG welder. You need to determine for yourself what’s going to work. What might seem like a good machine to one person won’t have the capability that a second person requires. Use our buying guide to narrow down what’s important to you. Then, you can go through our top ten choices to find the best MIG welder.